%i- Walk and Talk— Kim Engstrom, M.S. Embrace the fresh air and outdoors with Walk and Talk ! This is a unique form of counseling, in which we take advantage of nature's office space. A simple walk outdoors is an effective alternative to open up your mind and thoughts throughout your session. 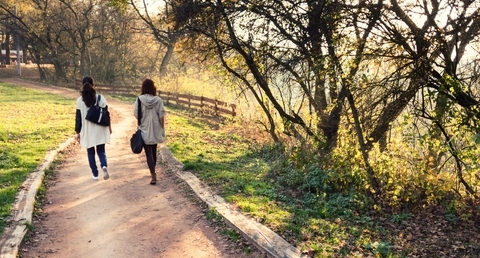 Walk and Talk improves your mental, as well as, your physical health. Not the best weather? Feel free to grab an umbrella or we can relocate indoors for your session! Walks take place in local parks, near my office or yours. Research has consistently shown that exercise and movement are significant ways to improve overall mood and decrease anxiety and depression. Clients who are uncomfortable or unfamiliar with the traditional forms of therapy, find walk and talk to be much more engaging and empowering. The action of moving foward while walking for some symbolizes taking action in their lives! Movement serves to enhance the counseling experience and helps clients feel less vulnerable and more open. Perfect way to incorporate fitness with mental health. Who could benefit from Walk and Talk Sessions? Have busy schedules and are looking for ways to be effective in their approach to their mental health and physical health. Hours now available in Center City Philadelphia and Chadds Ford. Online and Virtual Counseling are available options for those who prefer the comfort of their own home!